If you take a flat Crisp and bite through it there is only so much crunch available, but as these were so irregular in shape, biting through any Crisps was to bite through more than one flipped slice of the potato. This in turn allowed for a more crunchy experience all round. You can however have a bit too much crunch, but these even managed to err on the right side of degradation and mushiness. Many of the Crisps in our test bag were screwed up into small balls. Such was the curliness of the Hand Cooked Crisps that they were arguably a little over cooked (if there is such a thing). It would have been nice to see one or two ordinary looking Crisps, but we must not grumble about such matters; character is everything when it comes to the look and feel of a Crisp. The colouring was a gentle yellow with a fair few oil boils but not much else in the way of colour or distinctiveness. A Nose Plunge Test revealed a slightly burned Onion aroma. 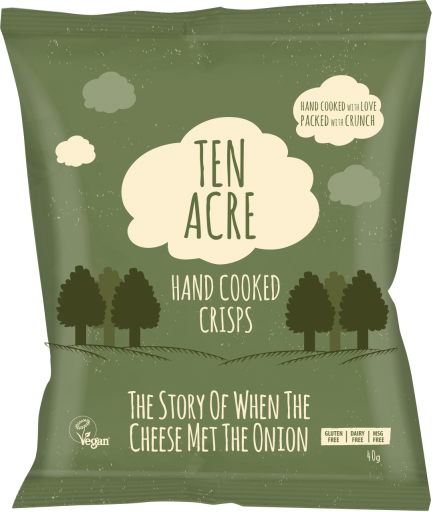 Unfortunately the flavour was a little lacking – there was a slight cheesiness mixed in with an appropriately matched amount of Onion, but it was nevertheless a little too muted. 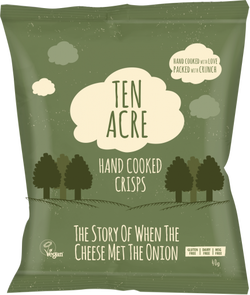 Having said all that when we reached the bottom of the bag the flavour seemed significantly stronger – this would suggest the flavour was concentrated on one portion of the Crisps or the seasoning fell to the bottom and the Crisps in that region of the bag benefited more.